Mary Alison Lucas is known for her biomorphic ceramic sculptures, rich in texture and color. Fascinated by entomology, botany and microscopic imagery, Lucas aims to capture moments of exhaustion and renewal, beauty and grotesque. Throughout the process she is contorting, pressing, slicing, smashing, prodding and stitching while nurturing, supporting, and soothing the materials. With the intention to blur the boundaries between structure and surface, a sculpture punctured with finish nails is initially vulnerable. Liquid clay coats and reinforces this metal bond and layers of glazes strengthen the overall structure. Mary Alison Lucas received her Masters of Fine Art at University of California at Davis after completing her Bachelors of Fine Art at the California College of Arts; her studio is in Oakland, California. Wild Ways at Trax Gallery: Bean Finneran, Mike Helke and Mary Alison Lucas: Gallery Opening from 5 to 7 pm on September 8th, a Friday. Patricia Sweetow Gallery: Exhibition Dates: July 13 – August 19, 2017. 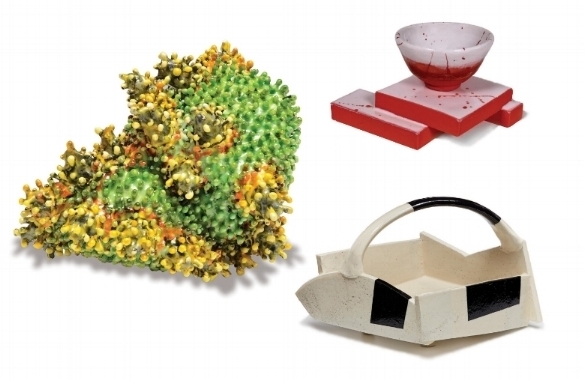 Intimate Abstractions: Ceramic Invitational curated by California College of the Arts Professor Nancy Selvin. Hey Baum fans! I hope you are as excited as I am for the first show of our season- So Tiny: An Exhibition of Small Works in 3-D. This show will be sure to captivate visitors with the miniature scale and the detail contained in each of the works of art. I’m personally looking forward to artist Mary Alison Lucas’ ceramic piece Curd being displayed. Oakland, California based Lucas uses various techniques and materials to distort her material till it is almost unrecognizable. Her techniques utilizing nails and multiple glazes produce a strange alien-like art that seems to be from another world all together. In celebration of their 25th Anniversary, Arts Benicia is presenting AB25 / Collective Memories. Curators Hedi Desuyo, Mark Eanes, and Erika Von Zoog combed through extensive archives to create a timeline retrospective representing 44 of the most memorable exhibits that have graced the walls at Arts Benicia over this last quarter century. vessels will be exhibited concurrently in the gallery’s main space. The juror, Jo Lauria, is a nationally recognized curator, historian and author specializing in contemporary crafts and decorative arts.